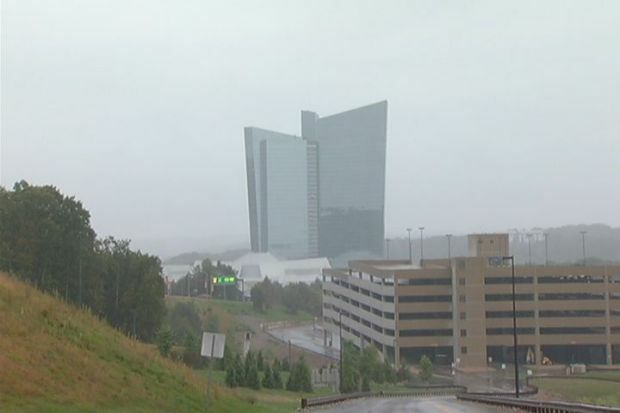 The signs of the struggling economy are again showing at Mohegan Sun Casino in Montville. The casino is laying off hundreds of workers, effective immediately, the mayor of Montville confirmed on Thursday night. Mayor Ronald McDaniel said that he's saddened by the news and that it will be difficult for those workers who got pink slips to find new jobs. The New London Day reports that 282 employees were laid off immediately and that another 46 would be let go by the end of October. The newspaper also reports that CEO Jeffrey Hartmann left the casino on Wednesday and that the casino will shut down its Keno operation. This is the second wave of layoffs for Mohegan Sun. In 2010, the casino laid off more than 300 workers. Businesses said the layoffs will have a negative impact on them because they depend on Mohegan workers to make a profit.